Eric Carle’s illustrations are easy to identify. My husband did not recognize his name, but recognized his artwork as soon as he saw it at the Montclair Art Museum (MAM). A kid-painted blue horse in at the Montclair Art Museum for the Eric Carle exhibition. Carle’s books are well-known staples in the world of children’s books. His writing is simple and he created his colorful illustrations by hand-painting tissue paper collages. Among the original collages on display at the MAM exhibit, are his sketches and book dummies/mock ups. The exhibit will be open until January 3, 2016. Click here for museum and event information. My husband and I were excited we were able to take our six-year-old niece to the MAM Lawn Party on Saturday. I think we enjoyed it as much as she did. 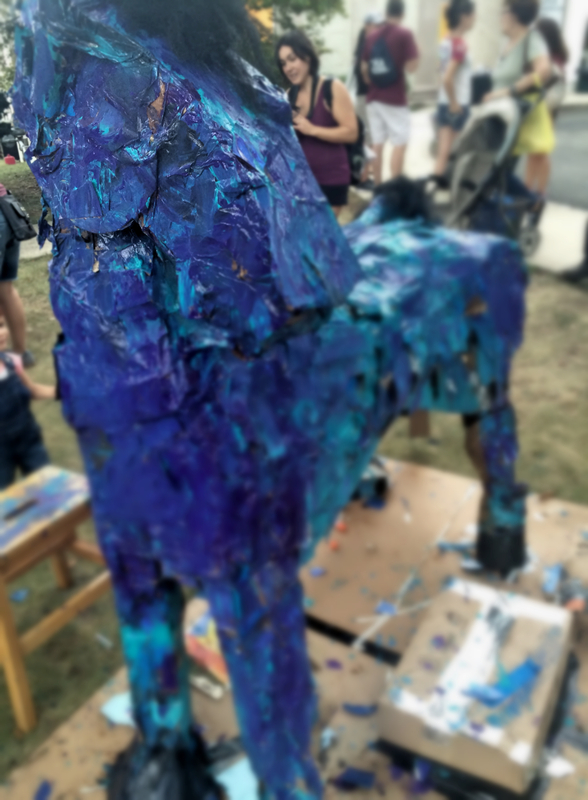 (But, admittedly, I was disappointed our niece did not want to paint the almost life-sized horse – blue – in Eric Carle fashion.) In addition to being able to check out Carle’s exhibit, Parents Who Rock featured a great line-up of local bands including Thee Volatiles. If you missed the festivities on Saturday, the MAM’s Eric Carle Family Day for more hungry caterpillars and blue horse celebrations on November 15, 2015.